A key poll in a key state has changed the character of the electoral math. That is Ann Selzer's poll for the Detroit Free Press in Michigan, which shows Barack Obama with a 7-point lead. This is the first Selzer poll in Michigan, and therefore we have no trendlines against which to compare. Nevertheless, Selzer polls are the gold standard -- the highest-rated polls in our database -- and so these numbers need to be taken seriously. Again, the question is not whether Michigan is winnable for John McCain -- it most certainly is, and we have him taking the state about 30 percent of the time. But it's a matter of whether Michigan is close enough to be the tipping point in a close election, and with Obama leading in each of the last seven polls of the state from six different polling firms, that is increasingly uncertain. If Michigan is off the table, then that gives Obama an advantageous position in terms of the electoral math: he essentially just needs to swing one of Colorado, Ohio, or Virginia to win the election. 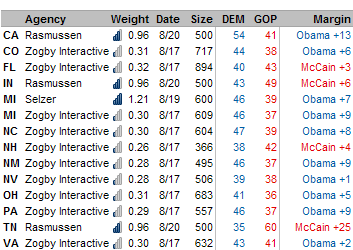 The other result worth picking out of this lineup is Rasmussen's first survey of Indiana, where John McCain is ahead by 6 points -- matching his margin in this week's SurveyUSA poll of the state. Although other polling had shown Indiana a bit tighter -- including a few polls that had shown Obama ahead -- the 6-point margin is about where our model had figured where the state was given the underlying realities of its demographics. On paper, Indiana is probably just outside of the range where it can be a tipping point state, but given the great disparity in ground game resources the respective campaigns have devoted to the state, it merits continued watching.